Specific correlations between audio parameters and visual parameters: Volume, Panning, Equalization, Compressor/Limiters, Noise Gates, Delays, Flanging, Choruses, Phasing, and Reverb. “The Limits of Imaging,” where a mix occurs in the space between the speakers. The basic concept of making a mix that is appropriate for the music and song. The details of each and every piece of equipment in the studio. How each piece of equipment is used in different styles of music and songs. 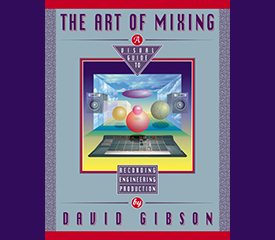 The difference between invisible mixes and mixes that add a musical component. The common musical dynamics that can be created with equipment in the studio. How combinations of various equipment can be used to create different styles of mixes. How to create a context (style of mix) and then completely blow people’s minds by abruptly changing it to another style.